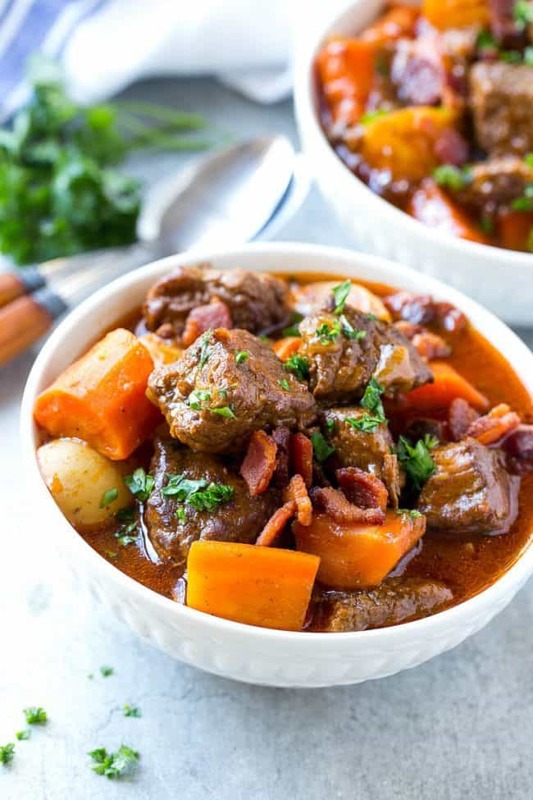 Beef Stew with Bacon is full of tender meat, colorful veggies and plenty of smoky bacon. 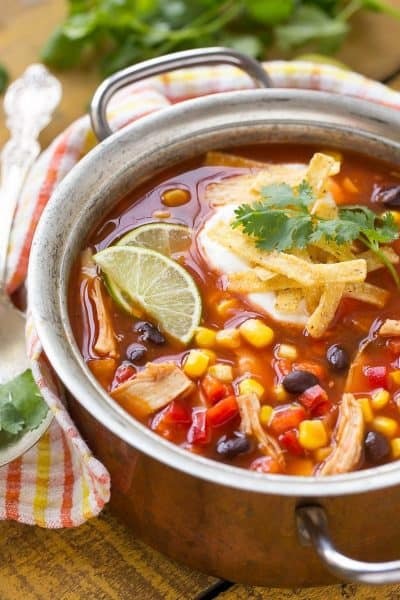 A one pot meal that’s perfect for cold weather! 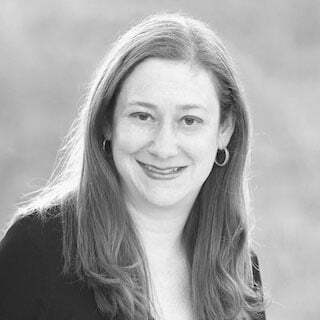 Hi, it’s Sara from Dinner at the Zoo coming to you with my family’s very favorite recipe for beef stew. 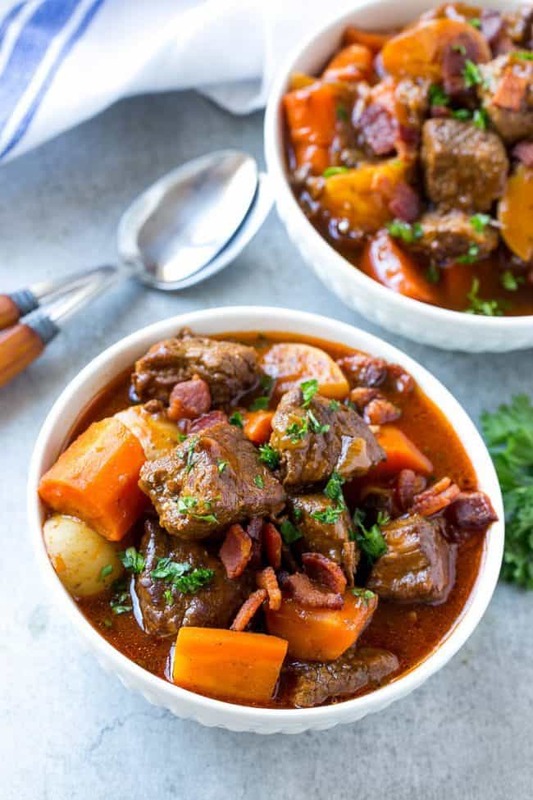 This isn’t your ordinary beef stew; it’s got a generous amount of bacon in it that adds a ton of rich and savory flavor! Because bacon makes everything better, right? 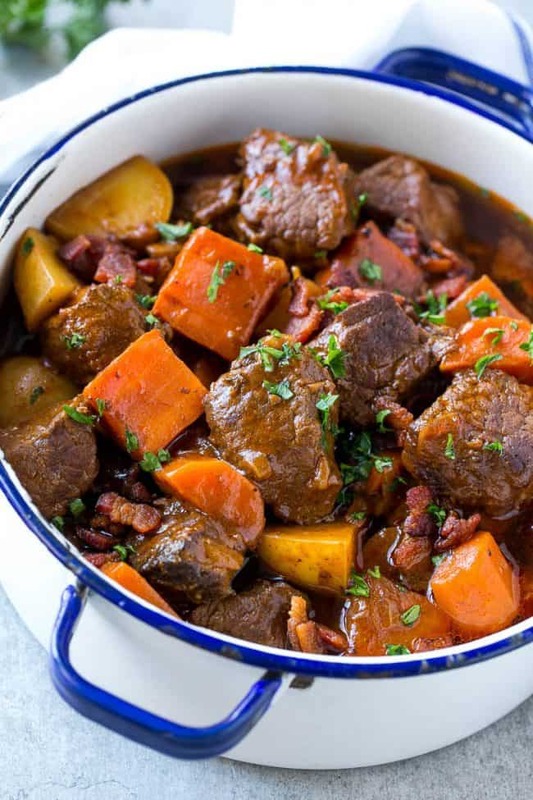 This beef stew with bacon recipe is pretty straightforward. 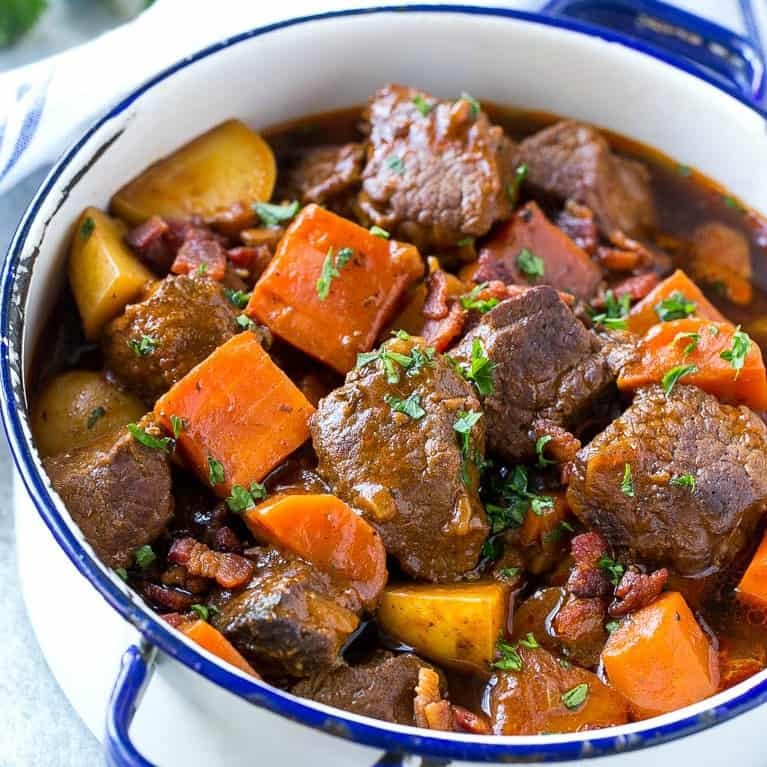 The chunks of beef are browned in bacon fat and slow cooked in the oven with potatoes and carrots for a hearty one pot meal that will satisfy even the largest appetites. The meat and veggies come out super tender and are packed with flavor. I add bacon during the cooking process, as well as a sprinkling at the end to preserve its crispy texture. I use the classic carrots and potatoes for the veggies in this stew, but you can change it up and add celery, sweet potatoes or even frozen pearl onions if you prefer. 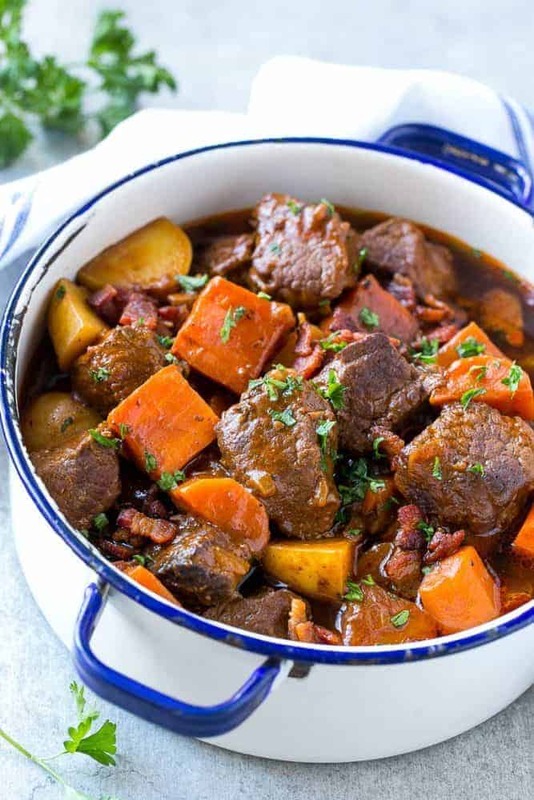 I often make a double batch of this stew and put half in the freezer for another night. If you’d like to freeze it, simply put the cooled stew into resealable freezer bags, flatten to remove the air, then seal and store in the freezer for up to 3 months. What I love about this dish is its simplicity. A handful of basic ingredients come together to make a comfort food classic that’s been a favorite in my family for many years, and is sure to be a hit with your family too! 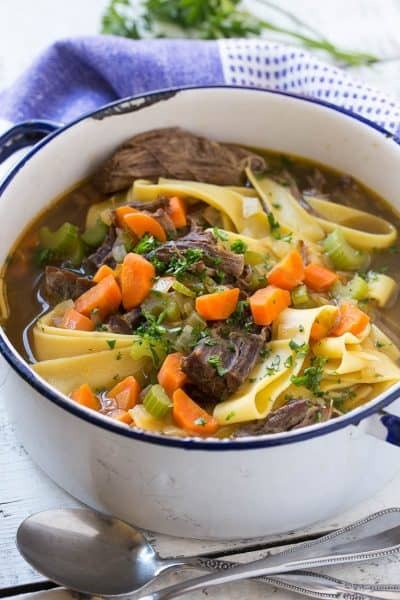 This beef stew is full of tender meat, colorful veggies and plenty of smoky bacon. A one pot meal that's perfect for cold weather! Preheat the oven to 350 degrees. Place a large pot on the stove over medium heat. Add the bacon and cook, stirring occasionally, until crisp. Remove bacon from pot and drain on paper towels. Set bacon aside. Discard all but 2 tablespoons of bacon fat from the pan. Season the beef generously with salt and pepper and add ½ of the meat to the bacon fat in the pot. Cook for 4-5 minutes on each side or until deep golden brown. Remove the beef from the pot and repeat the browning process with the remaining ½ of the meat. Remove the second batch of meat from the pot. Place the onion in the pot and season to taste with salt and pepper. Cook, stirring occasionally, until tender and lightly browned, approximately 4-5 minutes. Return the meat to the pot. Add the flour and tomato paste and cook for 1 minute, stirring to coat the meat. Add the thyme and beef broth to the pot. Cover the pot and place it in the oven. Cook for 2 hours. After 2 hours, remove the pot from the oven and stir in the carrots, potatoes and half of the bacon. Return the pot to the oven and bake for an additional hour, then serve, topped with remaining ½ of the bacon and chopped parsley. Wow, this looks delicious. My husband is a big bacon eater and will love this recipe!